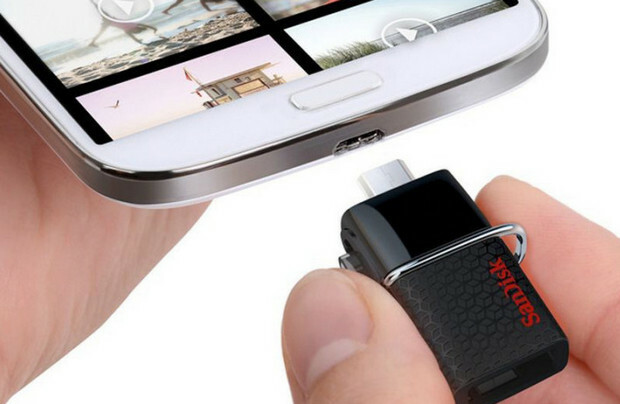 Add a half ton of storage to your Android device in an instant with the new SanDisk Ultra Dual USB Drive 3.0, a USB flash drive that comes with both a micro-USB and a speedy USB 3.0 connector for super-swift file transfers between On The Go (OTG)-enabled Android devices, PC s and Macs. Ideal for transferring content betwixt phone and laptop, the device works like a regular USB drive, except it also has a micro-USB connector so it can plug directly into your Android device. The drive simply connects via micro-USB to a compatible Android device and gives users up to 64GB of extra storage instantly. SanDisk’s Memory Zone app auto-launches once the drive is connected, with the company promising file transfers up to 130MB per second from the storage drive to your computer. “Android devices offer users amazing features including high-resolution photography and 4K Ultra HD video recording, which quickly fill large amounts of mobile memory, and we know our customers are looking for quick ways to access and transfer these types of files,” said Philippe Willams, director of retail storage, SanDisk. The new SanDisk Ultra Dual USB Drive 3.0 also comes with a retractable design to protect the connectors with a longer micro-USB connector accommodating device cases or port covers. SanDisk’s Dual USB Drive 3.0 is already available worldwide with capacities ranging from 16GB to 64GB, woth prices starting at $22.99 up to $64.99.